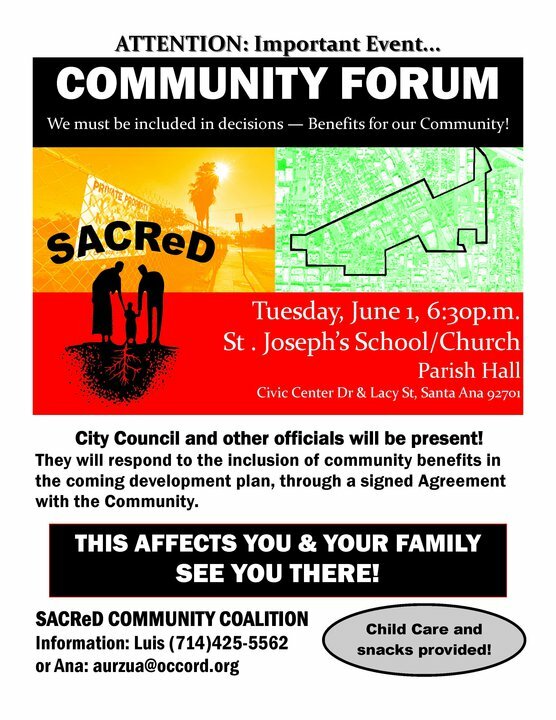 The community has united and organized under a coalition called SACReD, Santa Ana Collaborative for Responsible Development, and asks the City to sign a Community Benefits Agreement which will give the community the security and guarantee that the development projects of the Station District and Transit Zoning Code will in fact benefit the community. Without a legally binding, enforceable agreement, their promises are just promises, no different than the false words of support they had given to this community. Please plan to attend and confirm with us! La comunidad se ha unido y organizado bajo una coalición llamada SACReD, Colaborativo de Santa Ana para el Desarrollo Responsable, pidiendo que la Ciudad firme un Acuerdo de Beneficios Comunitarios, que les daría la garantía y seguridad a la comunidad de que el proyecto de desarrollo del Station District y el Transit Zoning Code realmente traerá beneficios a la comunidad. Sin un Acuerdo legal que se pueda hacer cumplir por la misma comunidad, las promesas son solo promesas, iguales a las falsas palabras de apoyo que nos habian dado hasta ahorita. Por favor confirmen su asistencía! What does the Community Benefits Agreement seek to enforce? 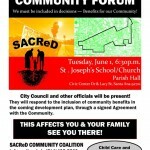 What criteria is being used to define and determine that actions are in fact beneficial to the community? Can anyone please elaborate further? I went to several of these meetings early on. The consultants to this group are from Los Angeles, where they have always failed to implement CBAs. My sources at City Hall tell me that there is no way the city is going to sign on to any of this. Nor will the developer. This whole exercise appears to be a waste of time. Even worse, the organization has been invaded by Usual Suspects – who are against immigrants and against affordable housing. Their new mantra is “green space,” but what that really means is – no more Latinos. It is the same bunch that put in traffic barriers in French Park, to keep Latinos out. The ACLU sued and won, and had those removed. There are some good people in SACReD but overall they have not accomplished much at all. I am a member of SACReD. We are a coalition basically made up of Santa Ana Stakeholders. Come by the forum so you can see for yourself what SACReD is accomplishing.